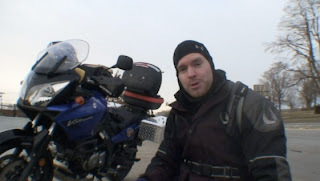 Geoff Smith is a motorcycle enthusiast hailing from St. John's, Newfoundland. With 30 years of motorcycle experience he's ridden most of the roads in Newfoundland and a lot of the off-road trails as well. And, in a stroke of luck for us, he always brings a camera too! My earliest and fondest memories of time spent on a motorcycle of my own go way back to 1978. My first bike was a used mid-seventies model Honda CT125, with knobby tires and ridiculously wide motocross handlebars. My first jumps, crashes, and experiences getting stuck all happened on that great little trail bike. 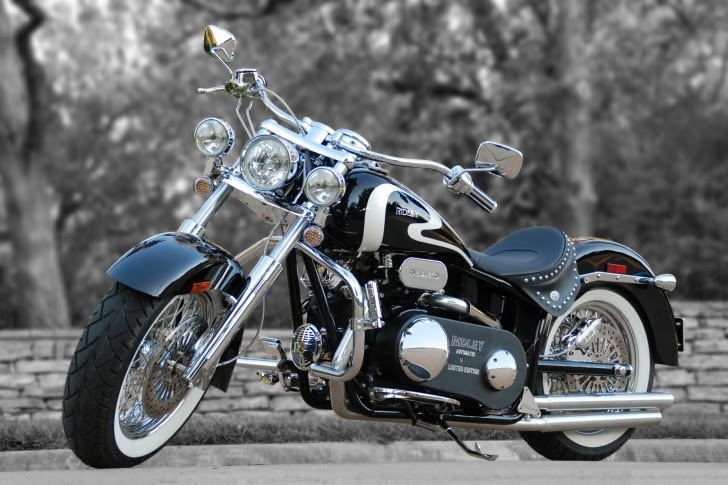 It was a very easy bike to ride, remarkably reliable, and just downright fun whenever or wherever you rode it. I’ve owned many off road bikes since selling my faithful old Honda CT125. I’ve had two motocross bikes; a Honda CR250 and a Yamaha YZ125; a pair of Yamaha IT enduro-class racers in both 175 and 200 cc versions; a Honda XR200 play-bike; a Honda XL250 dual-sport; and a Yamaha DT400 dual-sport bike. Those bikes all had their strengths and weaknesses, but only my 2004 Suzuki DRZ400S has come close to giving me the same kind of pure joy that I felt while riding my very first trail bike. The Suzuki DRZ400 has been around since the year 2000, and despite being a little long in the tooth nearly a decade later, it’s still one of the best options available if you want a bike that can be ridden as a commuter, handle serious off road trails, and single-track woods riding. It’s a bike that bridges the gap between bikes like the popular and potent off road only Yamaha WR450, and the venerable KLR650 dual-sport beast of burden from Kawasaki. The DRZ400 comes in three versions, these days. There is the original off road only ‘E’ model, the dual-sport ‘S’ model, and the more street-friendly ‘SM’ model. SM being the Super-Moto version. 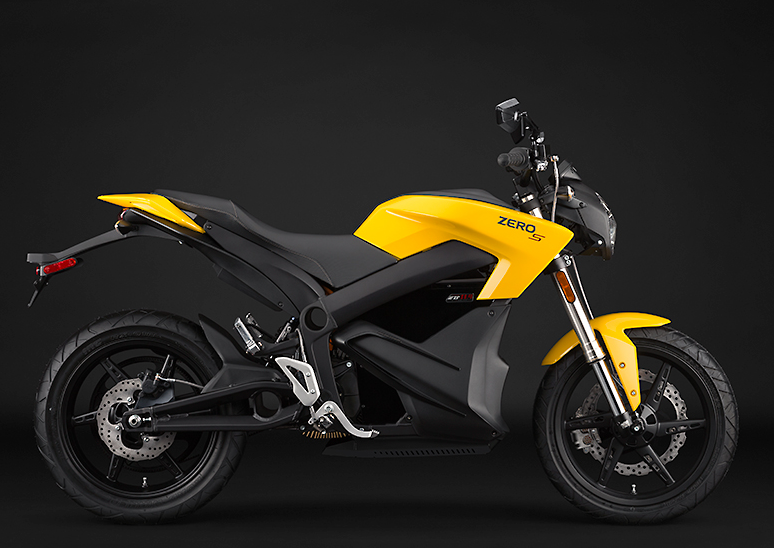 The primary differences the ‘SM’ model has over the E and S versions are smaller sport-bike-like wheels and tires (17” front and rear as opposed to a 21” front and 18” rear on the E and S models), inverted forks, and a tapered swingarm. 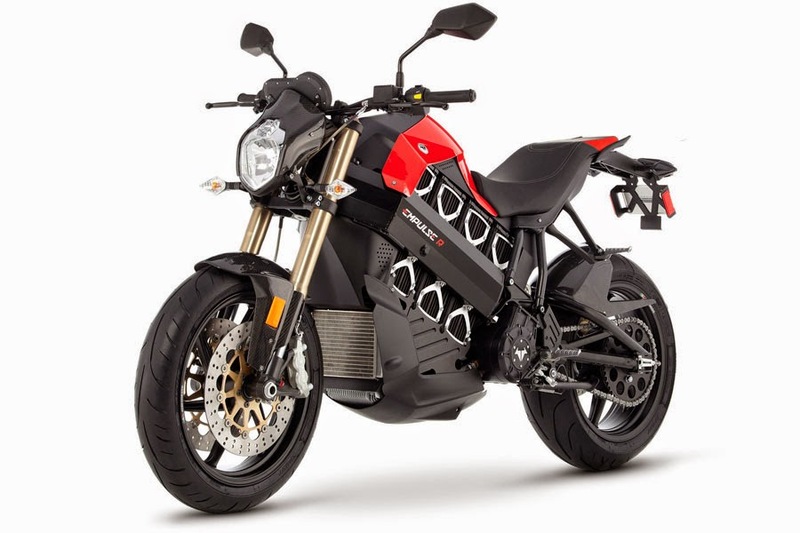 The present ‘E’ and ‘S’ model are virtually identical, with the exception of the ‘S’ model’s street-legal lights and other DOT running gear that one expects to find on a typical dual-sport motorcycle. In past years, the ‘E’ model was equipped with an FCR flat-side carburetor but now shares the same Mikuni carburetor found on the other versions of the bike. The ‘E’ model retains its slightly more aggressive cams, higher compression ratio, and slightly softer rear spring. "Mid-way through the DRZ400 production run, Suzuki and Kawasaki entered into a marketing agreement whereby Suzuki would manufacture and supply Kawasaki with both an off road and a dual-sport version of the bike. It was to be sold with green body parts, under the Kawasaki badge, and with the model designations KLX400R and KLX400SR. The agreement between the two companies only lasted a few years. To this day though, many examples of what are affectionately known as the ‘The Green DRZs’, can be found on the road, on the trails, and on the used bike market. The DRZ400 engine was also used in Suzuki’s high-performance four wheel ‘LTZ” all terrain vehicle. The long running production, general popularity of the bike, and the marketing agreement between Suzuki and Kawasaki means there is excellent parts availability and very good after-market support for the bike in all its forms. The DRZ400S comes equipped with tires designed primarily for street use and final drive sprocket ratios to match (15/44 front/rear). This street oriented setup makes the bike a capable commuter that doesn’t mind the occasional stretch of highway. 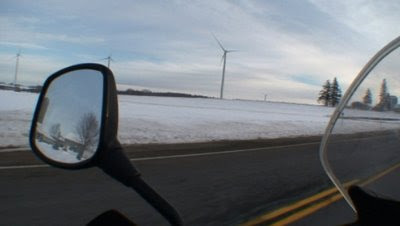 It is possible to take longer and more frequent rides on the highway but only if you can put up with the firm, narrow dirt-bike style saddle and lack of wind protection. 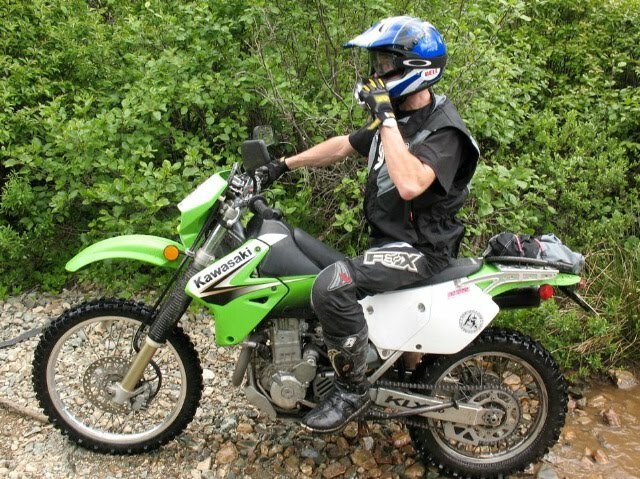 For true technical off road use, DOT knobby tires and a 14/47 sprocket-set are the way to go. This tightens up the feel of the gear ratios, and allows the bike to be ridden slowly over very technical terrain, without the rider having to repeatedly slip the clutch. 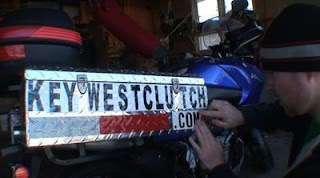 Engine case guards (to protect the soft magnesium alloy engine side cases) and an engine skid-plate (to protect the bottom of the engine and the vulnerable water pump) are wise investments for those wanting to tread a little further off the paved routes. The ability to adjust the suspension is one of the best features of the DRZ400. The dual-sport ‘S’ version shares the same suspension as the off road-only ‘E’ model. This setup gives you compression and rebound dampening adjustability up front. In the rear, there are adjustments for spring preload, high and low speed compression dampening, and rebound dampening. This wide range of adjustability allows you to tailor the bike to suit whatever conditions you’ll face. With a claimed dry weight of 291 pounds, the DRZ400S is considerably heavier than a Yamaha WR450F at 247.5 lb, but it’s also much lighter than a typical 650 cc dual-sport bike (The 2008 Kawasaki KLR 650 is 386 lbs for example). Once the suspension is properly dialed-in on the DRZ and the bike is rolling along with 14/47 sprockets, it feels much lighter than the claimed dry weight would suggest. 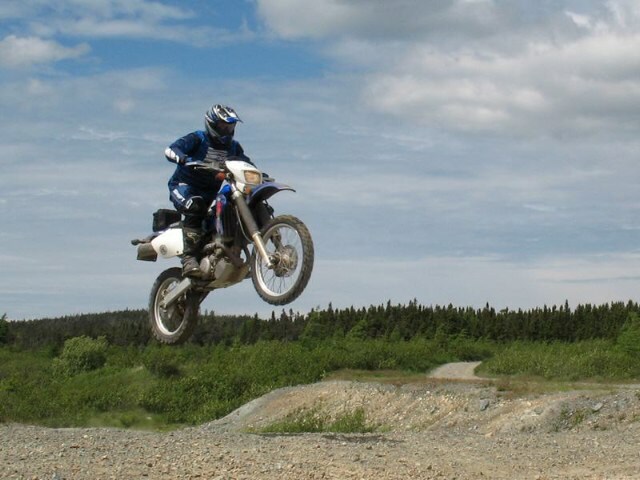 The bike tracks very well when the going gets really rough and loose with the help of a suspension on the slightly plush side for an off road bike. The DRZ’s forgiving suspension allows for “all day” trail riding comfort – you can stand on the pegs and ride a very long way before tiring. 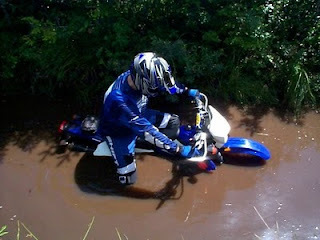 Misjudging the depth of a 'puddle'. The power from the liquid cooled 398 cc single engine is more than adequate, with lots of low end and midrange grunt. Suzuki claims 38 hp for the ‘S’ and ‘SM’ models, and 40 hp for the ‘E’ model. The brakes are very good, and the bike feels army tank solid beneath you. Reliability of the bike has also been a gold-standard, over the years. The DRZ is by no means a motocross bike, but you can toss it up and catch a little bit of ‘air’, if you so desire. The bike also seems very happy to cross deep stretches of water, without so much as flinching. I once found myself in water that was nearly up to the seat. After I drained the carburetor, the bike happily carried me for an afternoon’s worth of continued trail riding, without issue. The 10.0 litre tank gives you a range about 160 km’s, or roughly 100 miles, of mixed street and trail riding before hitting reserve. This is more than adequate for most people, but if you plan on riding many long distance trips, a larger fuel tank may be a useful addition. The stock seat is also quite firm and narrow for long rides on paved roads, as mentioned earlier. Luckily, the aftermarket has seen fit to fill this need and many after-market fuel tanks and seats are available. The bike lacks a sixth gear too, so the engine may tend to rev higher than many riders would like at highway speeds. Although this aspect is of no real concern from a mechanical perspective, since the DRZ engine is very happy when the revs are high, and it will buzz along all day without complaint. I am fortunate to live in the province of Newfoundland & Labrador, where there are literally tens of thousands of kilometers of both single track and ATV trails. This has made the DRZ400 a very popular bike on the trails where I live. The bike is well-suited to connecting trail networks via the many coastal highways which run through the rural areas of my home province. 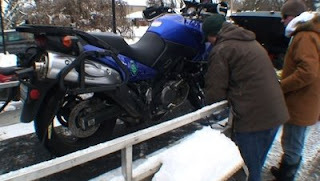 In the early spring of 2005 I found a good deal on a left-over 2004 model DRZ400S. 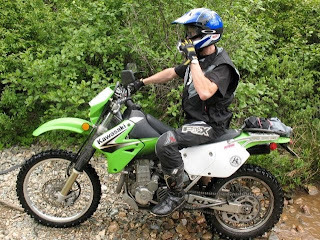 Soon after riding away from that local dealership I installed DOT knobby tires, off road armor, and a set of hand guards. A set of high rise motocross handlebars would follow those modifications, along with some other minor after-market bits and pieces. 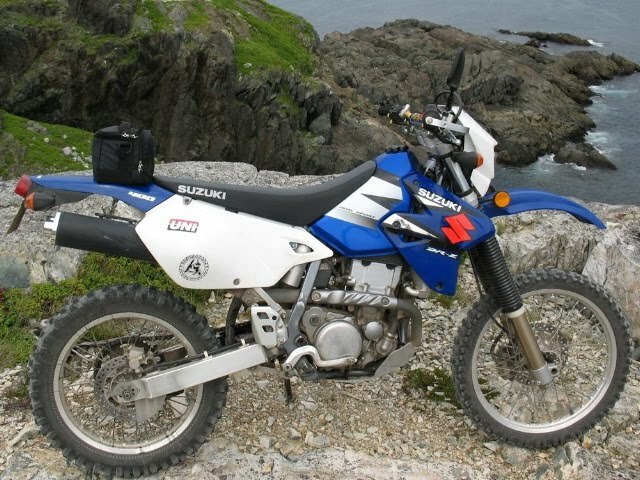 My riding buddies and I have explored many of the Island of Newfoundlands’ most interesting coastal trail networks, particularly within Eastern Newfoundland, from Cape Bonavista, to Old Perlican, to Cape Race. 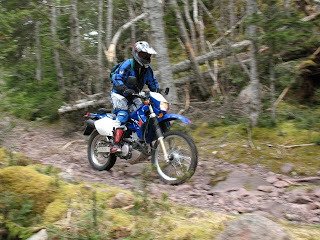 The trails in our region are typically a challenging mix of very rocky and very wet terrain. This is the type of trail riding where the DRZ400 really shines. There are few bikes on the market which have carved out such a distinctive niche, as the Suzuki DRZ400 has. Many of us who own the bike hope to see an updated version of the venerable model in the near future, maybe even a 450 cc version! But until then, the 400 cc version will continue to serve us well as an old faithful street and trail mount. For me, it will continue to be the only bike that never fails to produce the mile-wide grin I typically had on my face while riding my little red 125 cc Honda trail bike some three decades ago. My good buddy Lorenzo decided to brave some painful saddle time, and courageously join me on my planned trip from my home town of St. John's, Newfoundland, to do some touring on the West Coast of the Island. He ended up following me for 2,060 kms of the total 2,260 km trip. Not bad, considering he was riding a bike that was originally sold as a non-street-legal dirt-bike (Kawasaki KLX400R). I was riding my trusty 2007 model Suzuki DL650 V-Strom, which is an ideal mount for this type of long-distance cross-island trip. The V-Strom almost seems like it was designed specifically for touring Newfoundland & Labrador, with our abundance of twisty coastal roads, and dirt roads, which lead to many out of the way and interesting places. I had spent the previous two years riding thousands of kms on the island’s back-country trails on my knobby-shod and deep-geared Suzuki DRZ400S. The DRZ is a very similar bike to Lorenzo’s Kawasaki KLX400R, and they are in fact, both made by Suzuki. The KLX400R and KLX400SR represent a short-lived part of a marketing agreement between the two motorcycle manufacturers. 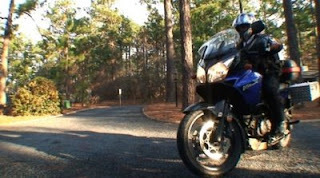 In the early spring of 2007 I rode away from my local Suzuki dealership on a brand new, Sonoma Red, DL650 V-Strom. No other bike I have ever owned, in thirty years of riding motorcycles, has ever inspired me to ride as often as this bike does. Between the day I picked it up from my local dealership, and the beginning of my trip across the island with Lorenzo, I racked up thousands of kilometers, while exploring the coastal roads on the eastern side of my beloved island home. Now it was time to venture a little further away on my trusty new steed, and take in some of the riding pleasures which the roads of the West Coast of the island have to offer. We had a log-cabin booked for three nights in the scenic West Coast town of Rocky Harbour, which is an enclave within Gros Morne National Park. The park is a designated World Heritage Site, and it is a beacon for geologists the world-over, due to having some of the oldest exposed areas of the earth’s mantle anywhere on the planet (The Tablelands Mountains). We left St. John's at 9:00 AM, during the second week of July, 2007. The limited fuel range of Lorenzo’s KLX400R, meant fairly frequent stops for gasoline. Roughly 190 kms was the most he could muster on a full tank, where as the DL650 can cover about 400 to 450 kms, between fill-ups. But I’m happy to take a break at around the 200 km mark, anyhow. A coffee addiction, and my 46 year old bladder, pretty much make it a requirement for me these days. We stopped for lunch at the town of Badger, before making our final push toward the West Coast. The weather was sunny all the way to Central Newfoundland. From Central Newfoundland to Gros Morne National Park we rode in cloudy and dry conditions. We arrived at Rocky Harbour at 6:30 PM after traveling 720 kms on the day. This first day of the journey was fairly uneventful, and was really just a point A to B type of ride across the mostly inland Trans Canada Highway (Route 1). Our real interest lay with settling in at our West Coast base at Rocky Harbour, and from there we would take in some choice routes which no one traveling the island by motorcycle should ever miss. After a fine meal at a local restaurant, and a couple of rums as nightcaps, we crashed and hoped for a restful sleep as we looked forward to exploring Western Newfoundland the following morning. The bikes were locked and chained together overnight, outside and just below Lorenzo’s bedroom window. 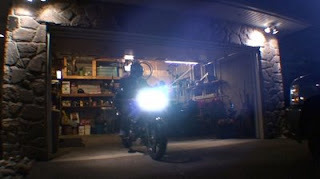 He said he slept lighter than he would have liked, thanks to his mild sense of paranoia about the bikes being safe and secure. If the bikes had been able to fit through the cabin door, I think he would have insisted we bring them inside to spend the night in our kitchen. As it turned out, the bikes were safe outside where we left them. After a hearty breakfast we headed southward and back down Route 430 from Rocky Harbour to Deer Lake, and then along Route 1, from Deer Lake, through the beautiful Humber Valley, through the city of Corner Brook, then further southward and westward to the town of Stephenville. 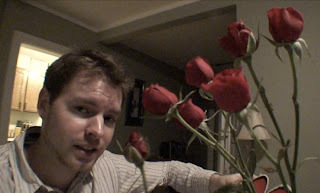 Our West Coast buddy 'Jon' (a.k.a. 'CoolHand') was waiting for us at the local Tim Hortons coffee shop, as planned, despite the fact that we were an hour and a half behind schedule, due to a late start from Rocky Harbour. As soon as I suggested how great it would be if CoolHand could join us on a trip around the historic and scenic Port Au Port Peninsula loop (Routes 460 and 463), he was on it. This area is CoolHand’s stomping ground, so it was going to be a real treat to have a local rider as our tour guide. His brother offered him his brand new Honda CBR600 F4, and away we went. The Port Au Port Peninsula is steeped in the history and culture of the mostly French peoples who settled the region. Its scenic beauty is also a fine match for its rich heritage and culture. A slow ride around the bottom half of the Port Au Port Peninsula loop, was followed by an extremely 'spirited' ride across the top half of the loop, once we realized we might run out of daylight and have to ride through Gros Morne National Park in the dark. The Gros Morne area has one of the largest moose populations of any area in North America, so riding through there in the dark is generally a VERY bad idea. Given their abundant numbers it’s hard to believe moose are not native to Newfoundland. Their numbers are partly due to the fact they have no natural predators on the island and an ample food supply. The large vegetarian animals appear well suited to island life and there are now more moose in Newfoundland than there are people in St. John’s! Early on - Before the rain! Despite our best efforts to make time, after leaving to head northward, we ended up riding through Gros Morne Park in the rain, and just as it was getting dark. We stayed close behind a large logging truck, which would slow to a painful pace, as it climbed the very steep mountain roads winding their way through the peaks and valleys of Route 430. Staying behind the big rig in the rain seemed safer than taking a chance on a moose stepping out in front of us in the dark. We were surprised not to have met any moose along the entire 70 km ride from Deer Lake to Rocky Harbour. Whew! Double rum and Cokes were just what the doctor ordered to calm our nerves once we safely reached our log cabin retreat in Rocky Harbour. Total riding distance for the day was 590 kms. Lorenzo had racked up 1,300 kms in 36 hrs on day 1 and day 2, and he said he was really starting to feel it. 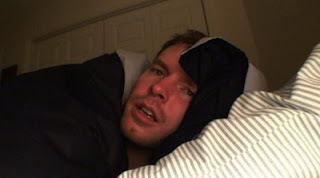 So he slept in on the third day of our adventure, while I headed off on the Strom toward Woody Point and Trout River. It was blisteringly hot with temperatures well over 30 degrees Celsius along the sheltered side of Bonne Bay (Route 431). This marvelous road runs from near the park entrance, toward the town of Woody Point, and beyond to the community of Trout River. The Tablelands Mountains are as awe-inspiring as it gets in Newfoundland & Labrador, and they always seem to have some snow left on their tops to make photos look a little more postcard-like. Total distance for me on Day 3 was 230 kms. Time to pay the piper! The beginning of the journey homeward, from Rocky Harbour to Badger, saw us riding through 252 kms of pelting rain. Central Newfoundland welcomed us with sunny skies, however. But, when we reached Eastern Newfoundland a hellish test of will began. From Clarenville to St. John's we had to deal with thick fog, rain, and high winds. This is typical of the weather on our big island which sits in the cold waters of the North Atlantic Ocean. Newfoundland & Labrador weather can be some of the most dynamic and unpredictable in the world. Bring plenty of layers, and make sure at least one of those layers is waterproof, if you plan a motorcycle trip to either the Island of Newfoundland, or Labrador, which is the mainland portion of the province. We somehow made good time crossing the island from west to east, despite the bad weather. I pulled into my driveway at 5:15 PM. Total distance for day 4 was 720 kms. Total distance for the three and a half day trip was 2,260 kms (1,400 miles). We had no flats, no breakdowns, no accidents, and we only saw one moose, and it was a dead one. Day 4: Rocky Harbour to St. John’s - Distance 720 kms. The Suzuki Bandit is classified under the “street” section of Suzuki’s website and they’ve been around for a while. But in 2007 they upgraded the engine from a 1200cc to smooth running 1250cc. Always known as being a good deal; the 2008 model maintains this most appealing feature. There’s an S edition and a SEA edition for 2008; they both come with ABS but the SEA edition adds a full fairing, and lockable side mounted hard bags (top bag is optional). The MSRP is $11,999. (MSRP for the S edition is $10,799). The engine is liquid cooled and fuel injected so you won’t have to fuss with a choke when starting it up. Throttle response is linear and immediate with no flat spots or lurching. It’s got near 100hp which may not sound all that impressive but what it does deliver in abundance (right around 80 ft/lbs) is torque! Torque numbers are up almost 20% over the 06 model. That torque comes on tap at a very low 3700 rpm instead of 6500 rpm too which makes pulling away in just about any gear possible without any bucking. Mated to a six speed gear box and you’ve got plenty of flexibility for all around riding and that 6th gear is particularly nice on long highway cruises and keeps the rpm’s nice and low; around 3450 rpm at 100km/hr, right in the peak torque range area! No need for downshifting to pass those pesky slow moving vehicles. The engine is a bit shorter which allows for a longer swingarm without adding length to the wheelbase which has improved handling. The frame has been beefed up and made more rigid, the suspension has revised damping rates, and is pre-load adjustable front and back. The new frame is also more rigid and the suspension has revised damping rates. For suspension it’s got telescopic, oil damped, preload adjustable in the front and link-type suspension, 7-way adjustable preload, 4-way adjustable rebound. It’s got an upright riding position, one-piece handlebars, beefed up frame rails, and a very comfy seat reportedly. For brakes you get dual hydraulic disc ABS in the front and a single hydraulic disc ABS in the back. The instrumentation is well designed with a large analog tachometer beside an equally large digital speedo. This is a nice setup because it’s easy to see at a glance exactly how fast you’re going with digital rather than have an analog sweeping gauge. An analog tach is just fine because you don’t really need as an exact measure. The emissions control and catalytic converter meet tough Euro 3 standards so you can feel a little better about all those long distance trips you’re going to want to go on. You won’t need to stop at the gas station quite as soon as the reserve light may indicate though. It’s said that the reserve light comes on quite early with this model, kicking in when you’re between 13-14 liters into the 19 liter tank reportedly. The Bandit comes with the standard Suzuki 1 yr warranty. GSX-650F that is! Suzuki is spreading the credibility of their sport bike GSX-R models a little further and have tagged a new 650cc street model the GSX650F. 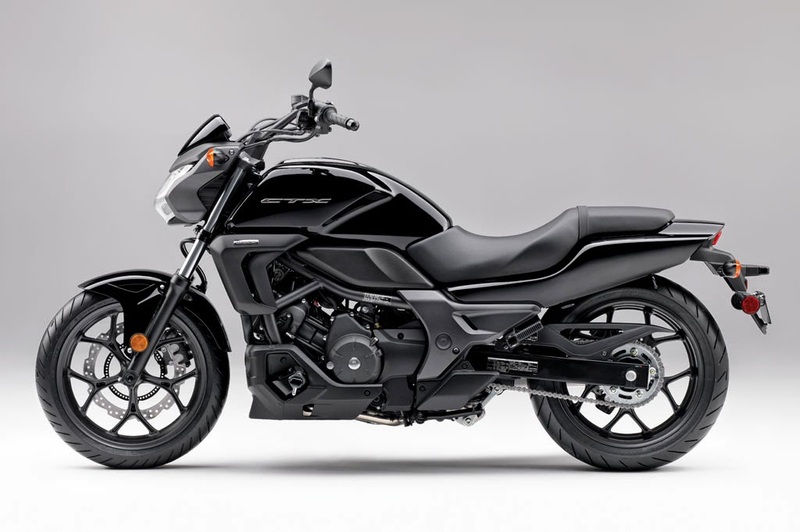 The bike comes with a compact, liquid-cooled, fuel injected, DOHC 656cc (Four-stroke, liquid-cooled, four-cylinder, DOHC, 16-valve) coming from the Bandit 650. It’s an inline 4 that based on its lineage should make about 75 horsepower. The GSX-650F is designed to be a sporty looking bike that’s targeting beginner riders while giving them some room to grow. Realistically this bike isn’t necessarily just for beginners, it’s got smooth power delivery, looks a bit sporty and has some upright ergonomics. Sounds like it’ll suit more than a beginner rider to me. It might make a nice commuter bike, light touring machine, and all round daily driver that’s a bit more forgiving. The bike has a full fairing as North Americans tend to buy faired bikes in greater numbers than naked. 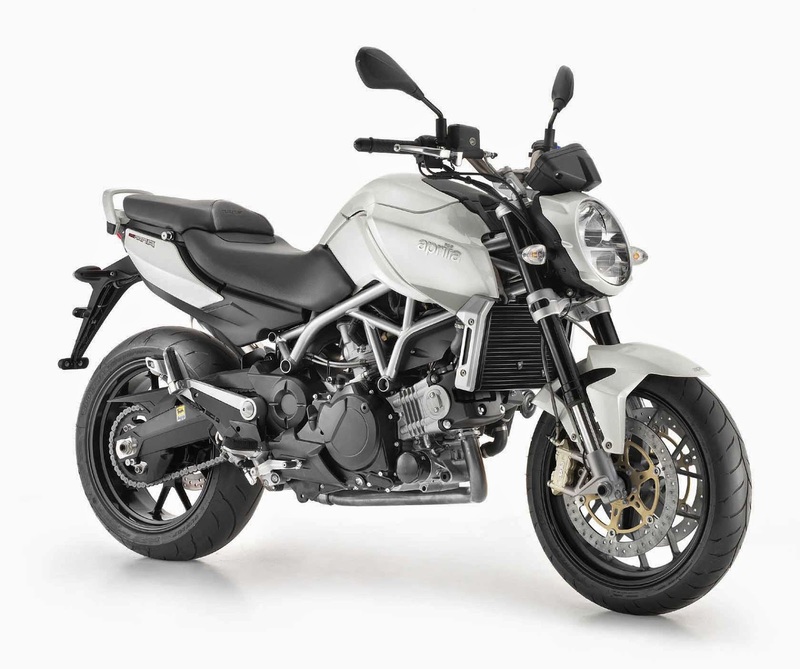 We don’t have nearly as many naked style bikes as the European market for example. From the handlebars back it looks an awful lot like a full-faired GS 500 except that the engine is a 656cc inline 4 rather than a 500cc parallel twin. Its got a significant horsepower advantage over the GS500. The GSX650F maintains its cool with a high efficiency radiator combined with a 190mm electric cooling fan controlled by the ECM and a high output water pump with a bearing-less design for reduced weight. New six speed transmission works smoothly with a hydraulic clutch for decisive shifting across a wide range of driving conditions. It comes with 41mm forks designed to deliver a smooth ride and feature preload adjustability for a variety of riding conditions. New rebound and preload adjustable rear shock works in conjunction with a link-type rear suspension for excellent road holding performance. Tokico 4 piston front brake calipers are used with a 310mm brake rotor combined with a lightweight single piston rear caliper and a 240mm rear brake disc. The seat is one piece - wide and comfortable, with low seat height for increased rider and passenger comfort. New GSX-R inspired instrument cluster includes a step motor driven tachometer, dual trip meters, reserve trip meter, clock, fuel gauge, and a useful gear position indicator. The fuel tank is specially designed to be compact so that the handlebars are easy to reach. It’s got a narrow mid section while still retaining a full 19 liter (4.2 imp gal.) fuel capacity. It’s not expected that the GSX650F will cannibalize sales from the popular SV 650/SV 650S models with their punchy v-twin engines. They have similar horsepower ratings but the power delivery is very different. I’d say it’s definitely a possibility it’ll take away some sales given the engine size and pricing is within a few hundred dollars of the SV. It's worth the risk though because despite the similar engine size and price, they're very different bikes. A SV650S with ABS has an MSRP of $8,799. If you’re in the Suzuki dealership looking for a bike in this price range chances are you’d probably take a look at both. So if you’re in the market for an inexpensive sport bike and are interested in a bit of comfortable fun then this bike is worth a look. * Suzuki’s US site indicates an MSRP $6999 - a difference of $1600. 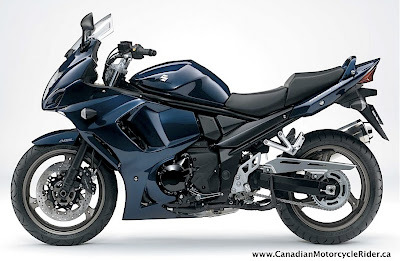 Link to Suzuki Canada's website.